Carlos Slim Helú, the world’s second richest man, was born to Lebanese parents in Mexico City in January 1940. Slim gained notoriety when he led a group of investors, including France Telecom and Southwestern Bell Corporation, in acquiring Telmex and Telnor from the Mexican government in 1990 during the presidency of Carlos Salinas de Gortari. Today, Telmex operates 90 percent of Mexico’s telephone lines. The mobile company Telcel, also controlled by Slim, operates almost 80 percent of the country's cell phones. And over the last five years, Slim's wireless carrier, América Móvil, has purchased cell phone companies across Latin America, becoming region's dominant company and counting on more than 100 million subscribers. 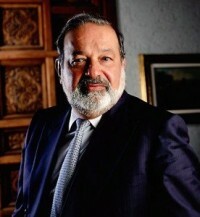 Forbes magazine, in March 2008, ranked Carlos Slim as the world's second-richest person, behind Warren Buffet and in front of former winner Bill Gates. Based on the value of his public holdings, Slim’s net worth is estimated $60 billion. Slim told the Wall Street Journal recently that he credits his prowess and flair, his ability to discover investment opportunities, to the writings of futurist author Alvin Toffler. It’s an intuition that gained him fame – and millions – in 1997, when he acquired 3 percent of Apple computer’s stock just before the company introduced its famous iMac computers. In recognition of his flamboyant business trajectory, Slim has been awarded the Entrepreneurial Merit Medal of Honor from Mexico's Chamber of Commerce. He also was voted C.E.O. of the Year in 2003 by Latin Trade magazine and C.E.O. of the Decade by the same magazine.